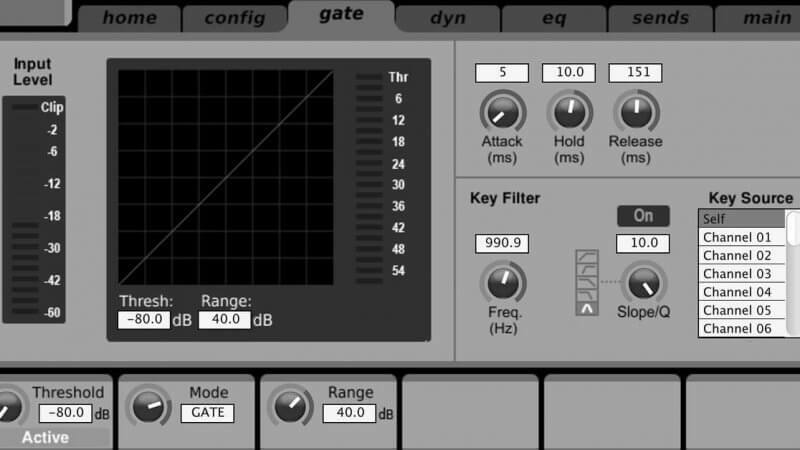 Audio gating allows you to suppress signal that is lower than a specified threshold while allowing everything over the threshold to pass through. If that went over your head, image standing in front of an actual gate and whispering, “Open, please”, but nothing happens. Then, you yell, “OPEN PLEASE”, and this time, the gate opens. The higher volume is what triggered the gate to open. First, let’s talk about when to NOT use gating. Never use gating just because it is available. It should only be used to solve a problem. That being said, is is unlikely that you will ever use gating on a keyboard or acoustic guitar. The most common use of gating is to cure mic bleed. Whether it is too much cymbal noise coming through the snare mic or too much stage noise coming through a vocal mic, gating can suppress mic bleed. Gating can also be used to clear up a signal. For example, let’s say your electric guitar has an annoying hum or buzz when they are not playing. A properly set gate will suppress the buzz while letting the actual guitar tone come through untouched. The first step to setting a gate the right way is to understand all the available controls. So, let’s go through them one-by-one. The threshold is where the gate opens and closes. Signal below the threshold will be suppressed (gate closed) whereas signal above the threshold will pass through (gate open). Start at -40dB and adjust to where the only thing passing through the gate is what you want to hear. Keep in mind, if parts of the signal are being suppressed that should be coming through, your threshold is set too high. The gate attack time controls how fast the gate opens once the signal goes above the threshold. Start with the fastest attack time possible, but if you hear a click or distortion when the gate opens, increase your attack time until the click disappears. The gate release time determines how fast the gate closes. In most cases, the release time should match the natural decay of the instrument. For example, a snare drum will have a shorter release time whereas a tom drum will have a longer release time so you can hear its natural decay. In short, if the gate opening and closing sounds unnatural, increase the release time until it sounds natural again. Hold time determines the minimum amount of time the gate is held open. Start with a short hold time (10ms). Then, if the gate is opening and closing too often, increase the hold time. Range controls how much the signal is suppressed once the gate is fully active. A good starting point is 40dB, as this will generally make signals below the threshold inaudible. But, if you can still hear the surpassed signal in the mix, increase the range. They key filter allows you to target a specific frequency range that triggers the gate to open. For example, let’s say you have a gate on the snare drum to cut out bleed from the cymbals but your cymbals keep sneaking through anyways. You could use a key filter to target a frequency range that is prominent in the snare but not the cymbals (i.e. 250Hz). This would prevent the cymbals from triggering the gate to open. Too much opening and closing. When the gate seems to be opening and closing uncontrollably, increase the hold time until this problem is resolved. Gate is cutting off what should be coming through. If a vocal was singing strong when you set the gate but is now singing a softer song, the gate may be suppressing the beginning or end of words they are singing. Decrease the threshold to solve this problem. Cannot fully cut out microphone bleed with threshold alone. Let’s say the hi-hat is coming through the snare drum mic, but when you get the threshold high enough to cut out the hi-hat, the snare drum gets cut as well. The fix is to use a key filter to target a frequency range that is prominent in the snare but not the cymbals (i.e. 250Hz). This would prevent the cymbals from triggering the gate to open. Awesome! Thanks for the lesson. We’ve been getting a hissing noise from the bass. Hopefully, I can apply this trick well enough to take care of this problem. great teaching on where to use gate and where not to use gate. Maybe this is addressed in another article, but when I apply my gates to our drums, we have slight issues of something light delay or latency where the signal from the drum hit comes through the channel slightly after it occurs. However, it’s pretty noticeable once he gets going. I’m the WL though, so I haven’t had the opportunity to check attack/hold/range, etc. while he’s playing and my tech’s aren’t as familiar with gating yet (still trying to get them comfortable with adjusting compression). I think this also has to do with (in/out) phase, but I’m pretty uneducated re that. Hey Mike – It actually sounds like your sound tech may have the gate set up as a ducker. Although not used often, ducking allows you to lower the volume of one audio source based on the input of another source. For example, you could have it set to where the bass guitar lowers in volume when the kick hits so that the kick comes through without overloading your subs. I generally don’t recommend using ducking, but you might want to take a look to see if that is what is going on.